Born Ellen Muriel Deason Wright, Wells started her country music career with her late husband Johnnie Wright in 1937. In 1952 she was the first female singer to reach No. 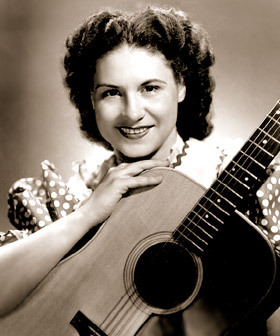 1 on the country charts with her signature song, “It Wasn’t God Who Made Honky Tonk Angels.” (below) The song was an “answer song” to the Hank Thompson hit from the same year, “The Wild Side Of Life.” Kitty was inducted into the Country Music Hall of Fame in 1976. From 1953 to 1968, various polls listed Wells as the No. 1 female country singer. Tammy Wynette finally dethroned her. She continued her performing career occasionally on into her 80s. WKRN reports funeral services will be held Friday at 1 p.m. at the Hendersonville Church of Christ in Hendersonville, Tenn. Burial will follow in Spring Hill Cemetery. Visitation will be held Thursday from 2 p.m. to 8 p.m. In lieu of flowers, donations should be made to Goodpasture Christian School, C/O Kitty Well/Johnnie Wright Scholarship Fund. i love old country music about the time of Tammy and George. What a beautiful woman and voice!! !